This versatile table top display is quick and easy to assemble. Just open and connect the all metal arms and you're ready to go. 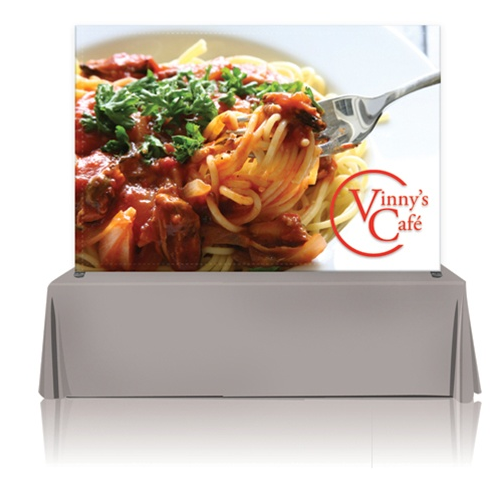 The Pop Up display displays hi res images yet is compact for easy storage. The graphic remains on the display and may be replaced when your design changes. This unit features heavy duty metal connectors. Size is approximate, Please download a template when creating your file. Templates are pdf format. We suggest opening this template in Adobe Illustrator and designing in a layer called "Design." Crop marks and additional bleed are NOT necessary. Simply design to the edge of the template. All images should be CMYK, no RGB images please. For best quality, use vector graphics only. raster images should be 125 dpi at the full size. Sales tax note: shipping this item to California, Hawaii or Pennsylvania will add sales tax, even if your company is tax exempt. This amount will not be reflected in your check out total, but will be invoiced prior to shipping. Learn more about this change.